Dr. Luis Rey is an experienced general practitioner, with advanced knowledge on Prosthodontics and great patient care skills, providing an excellent dental experience. Dr. Rey first received a Doctor of Dental Surgery (DDS) degree at the Javeriana University School of Dentistry in Bogota, Colombia back in 1984. He then obtained a Master’s Degree in Prosthodontics and Oral Rehabilitation in 1993, at the Nueva Granada Military University in Bogota, Colombia. Dr. Rey also recently obtained a Dental Medicine Doctor (DMD) degree at the University of Puerto Rico in 2013, where he achieved a perfect score on his CITA exam and developed a five-month clinical study with implant-supported prostheses. 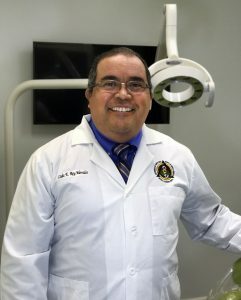 Throughout his career Dr. Rey has had the opportunity to both teach and practice dentistry, having established private practices, and worked as a professor in Prosthodontics for the Metropolitan University and the San Martin University in Barranquilla, Colombia for several years. He has also been a part of the Colombian Prosthodontics Association, the Colombian Dental Federation, and the Board of Directors of the Javeriana University Dental Association. He is currently a member of the Texas Dental Association.